Special thanks to The White Company for provide these five steps to better sleep! Sleep is one of the human body’s most pressing and vital needs for good health. Going without sleep or, or getting only broken, intermittent sleep leads to to decreased quality of life, inefficiency at work, and grumpiness. Here are five ways to improve the quality of your sleep. First on the list, treat your bed like a bed. That is, a bed has one primary function (and one secondary function we need not address). Reading, eating, working, or watching TV in bed teaches your body to treat the bed as a place where wakefulness is necessary. Do those things elsewhere, and use the bed for sleep. Treating your bed as a place of comfort, relaxation, and restoration means you can dress it with comfort in mind. Maintain your mattress, keep your bedclothes clean, and invest in some quality bed linen and sheets. Everyone knows not to drink coffee in the evenings to keep caffeine from hot-wiring your brain before bed (though it bears repeating). Likewise, while exercise is great for keeping the body healthy (which in turn helps sleep), it’s not a good idea to do strenuous exercise in the hours leading up to bed. Nor is it a good idea to drink a lot of fluids right before bed (stay hydrated throughout the day so as not to wake up parched in the middle of the night!). In the hours leading up to sleep, there are activities you can engage in to to gear down, become more relaxed, and prepare to rest. A warm bath is a popular and effective means of relaxing physically and mentally. Combine with low lighting, soft music, or some light reading (no thrillers!). Be sure to take enough time to be completely dry before bed. Moisturizing with lavender-scented lotion can likewise be very soothing before bed (and good for the skin). Don’t put your smartphone on the nightstand. This can’t be emphasized enough. Don’t bring a tablet or laptop into the bedroom. Even the tiny blue led light from the various electronic devices, and chargers associated with modern life have proven to detrimentally affect sleep. Move them out of the bedroom, and if you can’t move it, put a piece of electrical tape over those pesky lights. When all else fails, seek medical help. If you snore regularly (and not just after Thanksgiving dinner or Superbowl Sunday), you may have sleep apnea, which is debilitating and can exacerbate other health concerns. A sleep study will help your Dr. determine the right course of action to alleviate these symptoms. If you follow these steps, you can ensure better, more healthful rest, and brighter, less grumpy wakefulness. 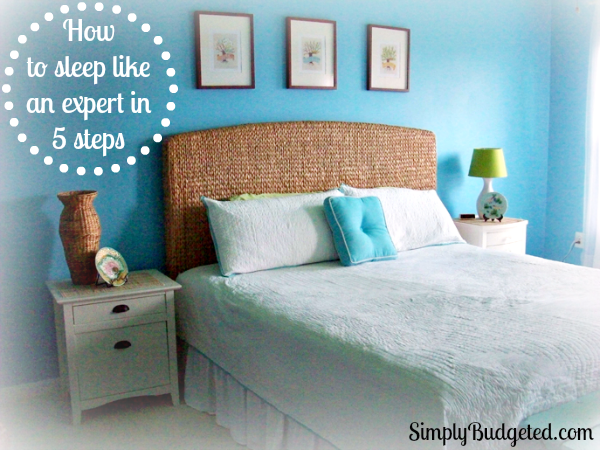 What is your tip to get better sleep? Which step do you need to do for better sleep? Leave us a comment and let us know! I love those tips. I’m guilty of trying to get in a few more minutes of work while lying in bed. It’s not my greatest work and I’m messing with my body. Not good! Thanks for sharing those tips. These are all valuable tips and well worth considering doing. Thank you for sharing these tips. I’ll be sure to keep these in mind. Thanks again! All really good tips. Preparing yourself and ridding distractions prior to bed helps a lot. I fall asleep within 5 minutes of putting my head down. I just need to get myself a little more sleep. See the coffee thing gets me. I get so tired in the afternoon and I often drink a cup, I bet this could be wny I have trouble getting to sleep sometimes. Great tips! I need to put away my phone earlier. These tips are fantastic! That first one is a toughy for me, for sure! We used to have a TV in our room and eliminated that distraction. I think hubby and I both sleep better because of it.